I've had butterflies in my tummy for the last few weeks, I am itching to find out what the universities decisions are. I got my first Unsuccessful pretty quick from Greenwich, I half knew I would because they don't accept my qualification but after calling the university and getting NO help from the workers I applied anyway. I didn't want to go there but I needed to add more than two choices, I needed to feel like I have more options. Anyway I got two postcards from UCB today, got me all excited knowing they have my application. I have my fingers, toes, arms, eyes, legs and everything else crossed. I applied for two courses at UCB. 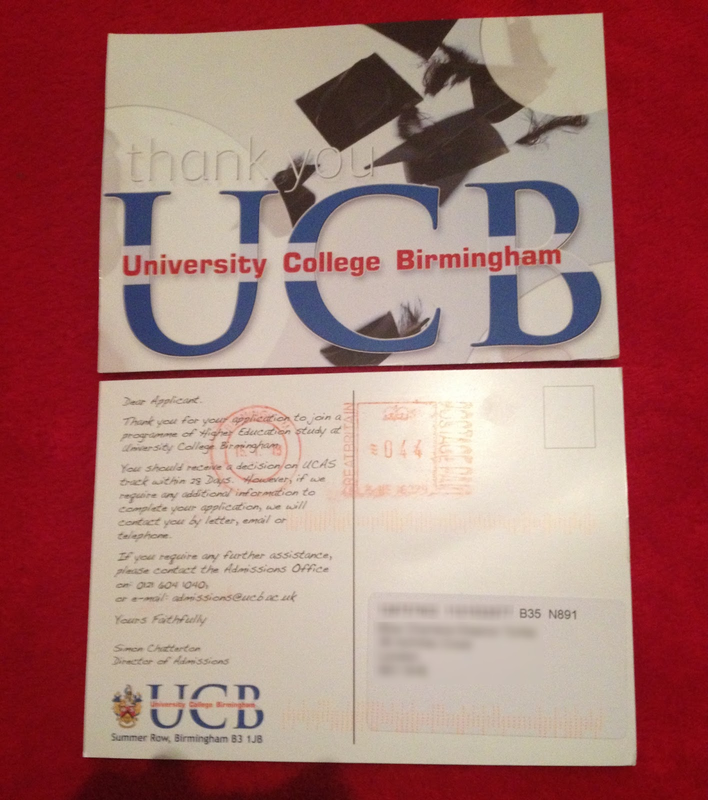 The foundation course and the BA Hons course. My qualification is an NVQ and not an A-Level so I don't have a wide choice of universities and I'm not sure if any will even accept me. So applying for the Tourism Business Management foundation course may be my best bet, I can still do the BA Hon but it is two year foundation and one year BA Hon not the normal three year BA Hon. I don't mind what way I go about it. Both lead me to the same place but a foundation is a little easier. I am going East London on Saturday to see the University with a few people in my class. Hope it goes well. I don't want to fall in love with it and they don't accept me haha. I hate the feeling of maybe being let down. GOOD LUCK!!!! You'll do great. I just had to go through this (we have different semester start times in Australia) so I know how you feel. Thank you Anna, hope it went well for you.